This painting is apparently created by Bihzad, the famous master painter of the Safavid era. According to Wikipedia, Kamāl ud-Dīn Behzād (circa 1450 – 1535 A.D), also known as Bihzad, was a Persian painter and acted as the head of the royal ateliers in Herat and Tabriz during the late Timurid and early Safavid periods. He is among the most famous masters of Persian miniature painters, though he was more accurately known as the director of the royal workshop producing manuscript illuminations. He is known for his colorful paintings as well as his attention to details. He is also among few royal painters who paid attention to capture the lives of average people in his works. 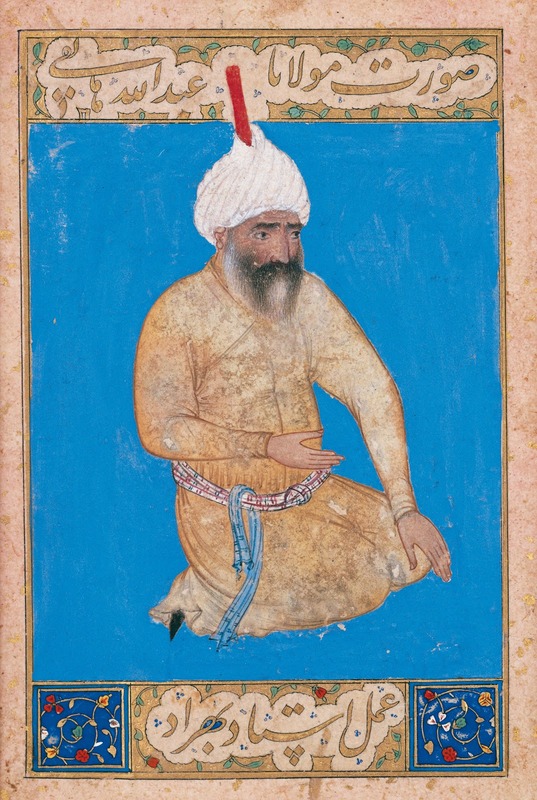 The subject of this painting seems to be the Persian poet Abdullah Hatefi . He was born in a village that is today part of modern Afghanistan. He lived from 1454 to 1521 A.D. and was a nephew of the famous Sufi poet Abdul Rahman Jami . Since Hatefi was a devoted follower of Shi'ism , he was greatly honored by Shah Ismail I  the founder of the Safavid dynasty of Persia. Most likely, this painting was commissioned by the order of Shah Ismail after he conquered the City of Herat  to commemorate the king's brief meeting with the poet.